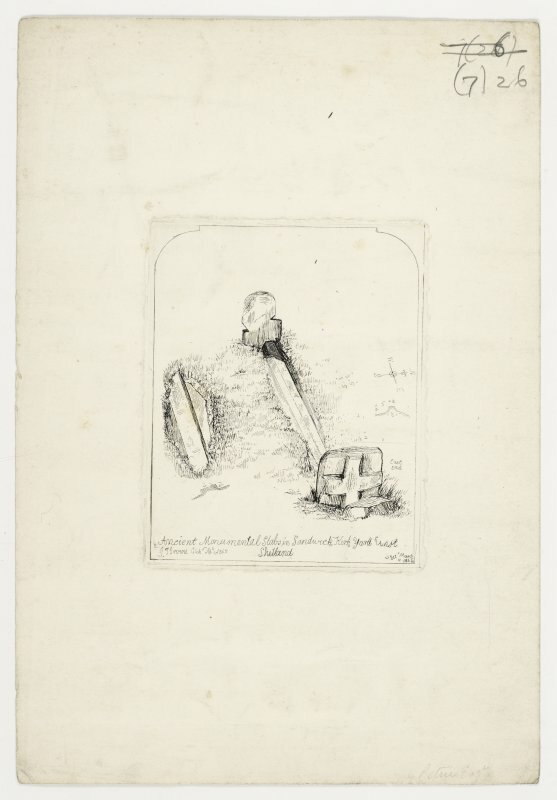 Sketch drawing of coped recumbent stone in Framgord burial ground, Sandwick, Unst. 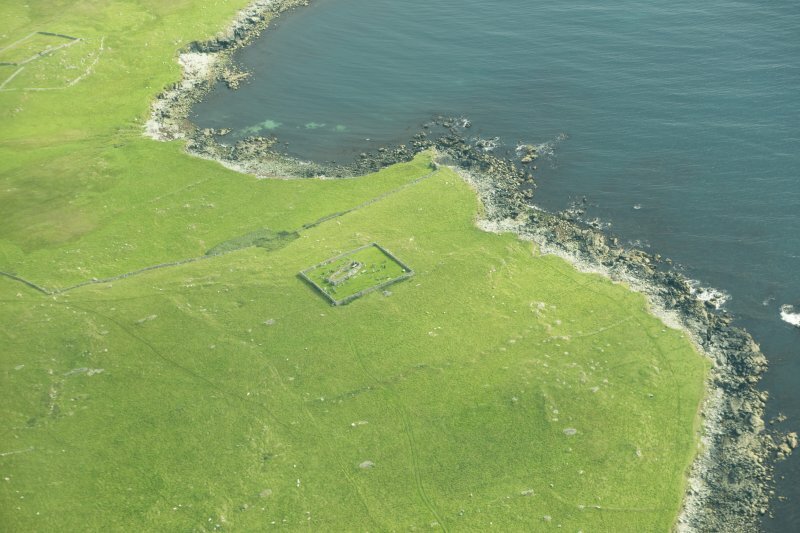 Oblique aerial view of Framgord Chapel, Sandwick, looking NW. 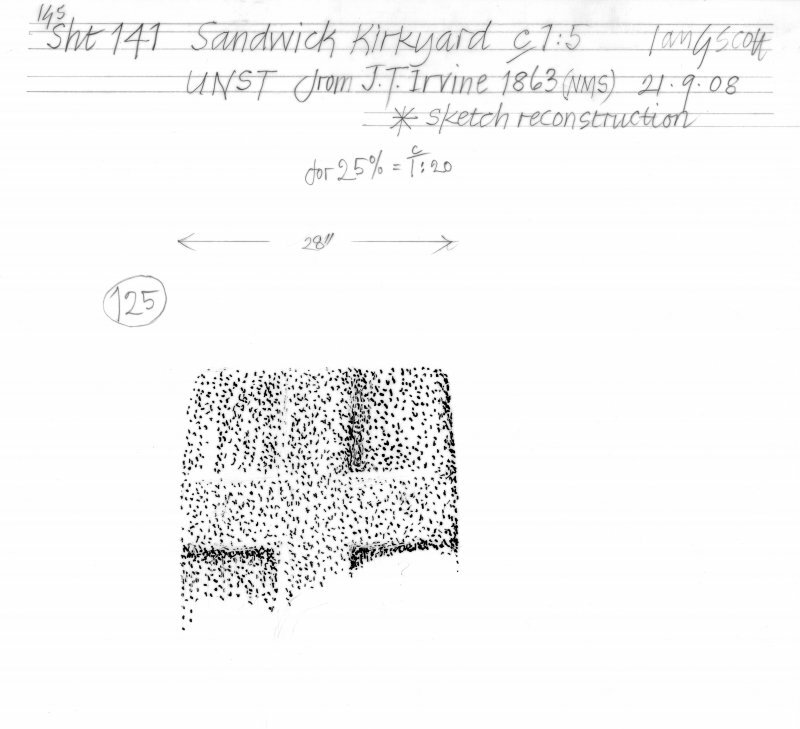 Scanned ink drawing of cruciform stone at Framgord, Unst. 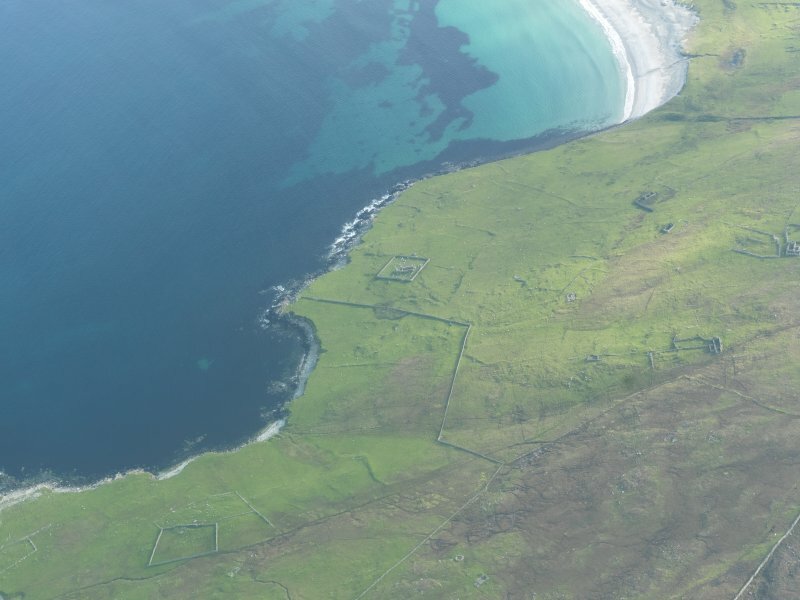 Oblique aerial view of Framgord Chapel, Unst, looking WSW. General oblique aerial view of Framgord Chapel, Puddle, Sandwick, looking SSW. 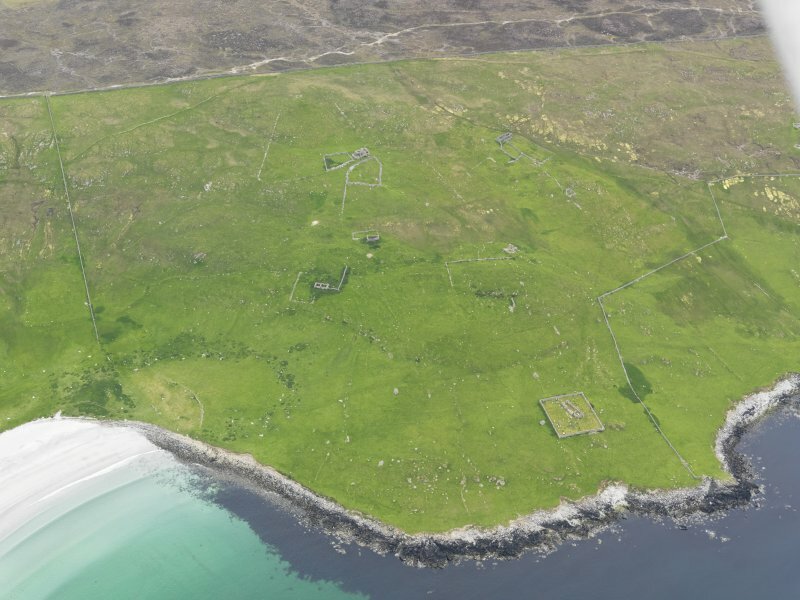 Oblique aerial view of the farmsteads, field systems and Framgord chapel, looking WNW. 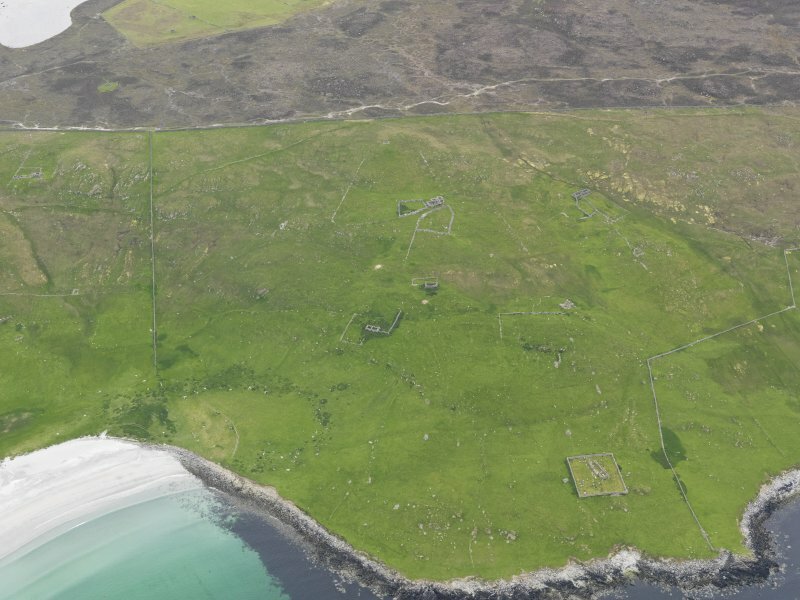 Oblique aerial view centred on the remains of the chapel and burial-ground with the remains of the croft buildings adjacent, taken from the NNW. Oblique aerial view of the farmsteads, field systems and Framgord chapel, looking NW. Drawing of carved stones one with cross detail. 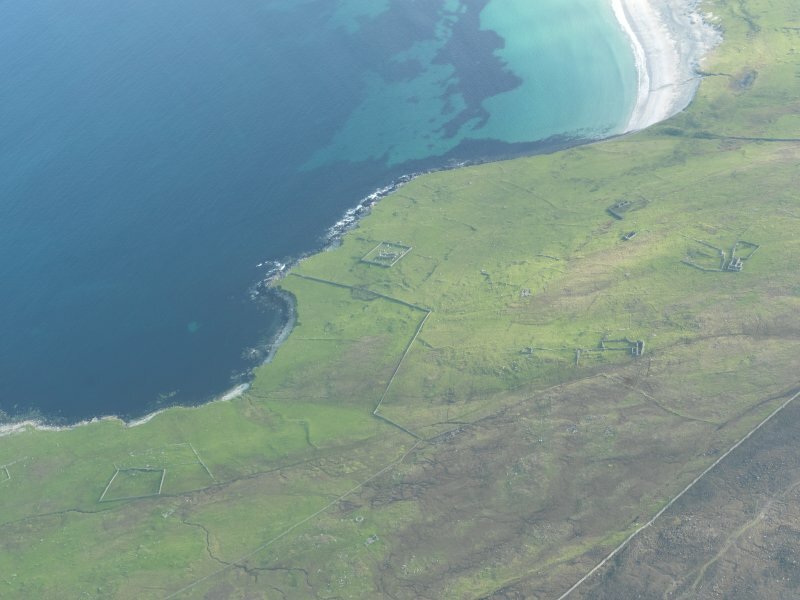 Lundawick Unst, Framgord, and Fetlar. Drawing of a carved stone with cross detail. 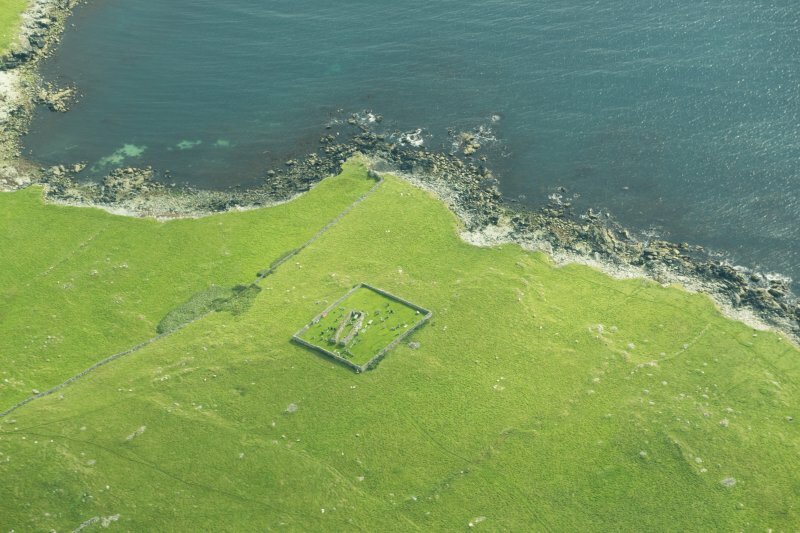 Sandwick Kirkyard, Unst. Scanned ink drawing of relief cross at Framgord, Unst. 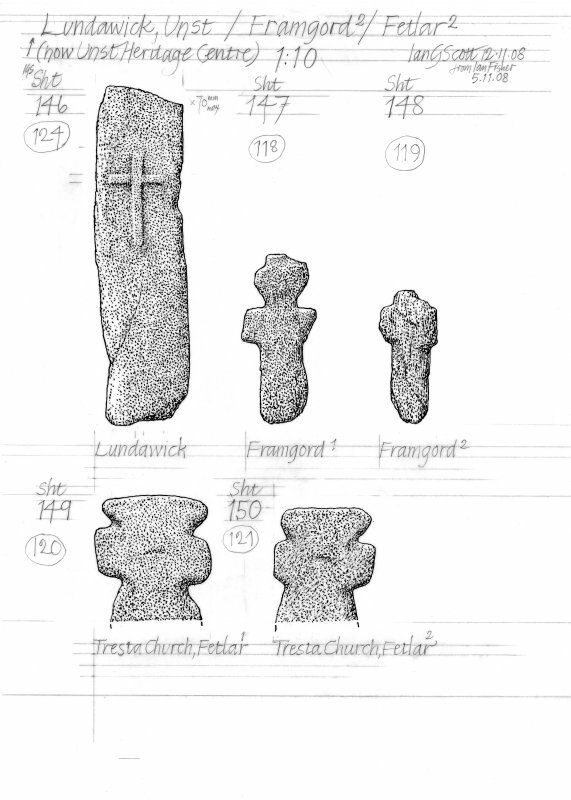 Scanned ink drawing of cruciform stone with relief cross at Framgord, Unst. Present location: in the churchyard at Framgord. 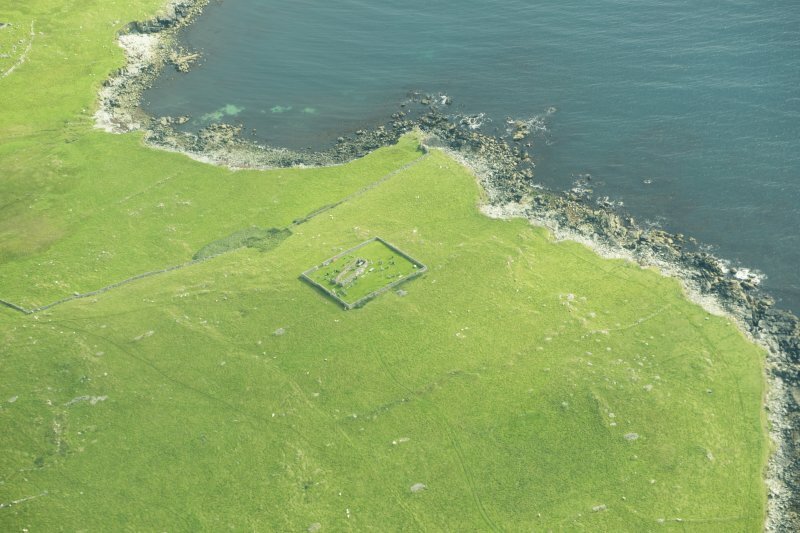 Evidence for discovery: recorded by RCAHMS in 1930. This cruciform stone has rounded arms and the side-arms are shorter than the upper arm. References: RCAHMS 1946, no 1539; Scott & Ritchie 2009, no 114. One vertical side of this stone has sheared off, leaving one intact side-arm, short and with a squared terminal. Part of the upper arm is missing, but it had an expanded shape, as did the shaft. References: RCAHMS 1946, no 1539; Scott & Ritchie 2009, no 115. This cruciform stone is a good intact example of the form with expanded upper arm, short side-arms with squared terminals and pointed foot to the shaft. References: RCAHMS 1946, no 1539; Scott & Ritchie 2009, no 116. This stone has short squared arms and a flaring shaft, and it is notable for the addition of a second inner cross carved in relief. References: RCAHMS 1946, no 1539; Scott & Ritchie 2009, no 117. A slender example of a cruciform stone, this has short side-arms, flared expanded upper arm and a straight shaft. There is a tenon-like extension to the op of the upper arm. References: RCAHMS 1946, no 1539; Scott & Ritchie 2009, no 118. Present condition: worn and battered. This stone has a straight shaft and foreshortened squared arms. References: RCAHMS 1946, no 1539; Scott & Ritchie 2009, no 119. This fragment is the top part of a slab carved in relief with a cross. The arms exten to the edges of the slab, but most of the shaft is missing. Date: eighth or ninth centuries. References: RCAHMS 1946, no 1539; Scott & Ritchie 2009, no 125. Present condition: worn, and there is damage to the edge of the slab to the left of the shaf of the cross. This was an almost oval slab, carved in relief with a cross with expanded terminals to the side-arms and a large disc terminal to the upper arm. The foot of the shaft is missing. Date: tenth to eleventh centuries. References: RCAHMS 1946, no 1539; Scott & Ritchie 2009, no 128. (In Ruins) Burial Ground (TI). A ruined chapel, probably pre-reformation, standing within its burial ground which was still in use in 1878 (Name Book 1878). 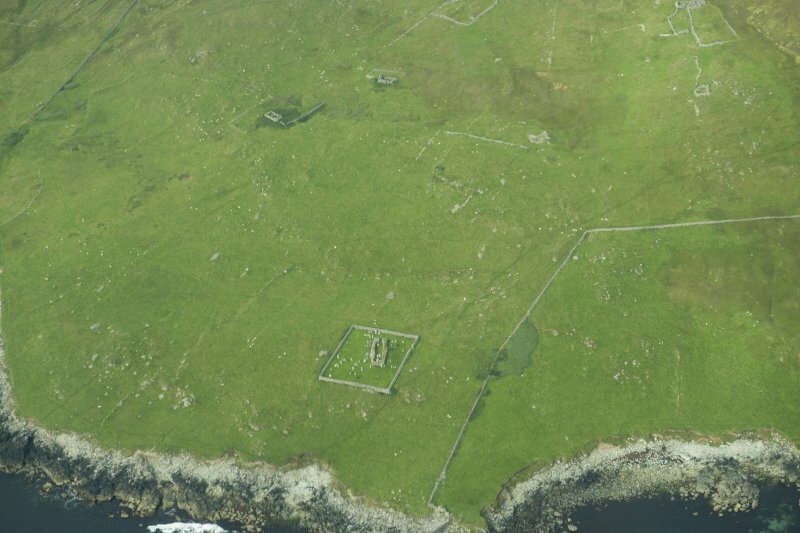 The chapel is oblong in plan, measuring (internally - not 'overall' as stated by RCAHMS) 36' 10" (11.22m) E-W long from 10' 6" (3.2m) to 11' 9" (3.6m) N-S. The walls which are very irregularly built, varying from 2'11" (0.89m) to 5'2" (1.58m) in thickness, stand to a maximum height of 6' (1.83m) on the west. The only opening traceable is an entrance in the middle of the west gable. Internally there are slight indications of cross-walls at 15'6" (4.72m) from the east and again at 11'6" (16.77m) from the west end. Within the burial-ground, beside some upright slabs carved with rude crosses, lies a recumbent cross-slab as well as five roughly formed coped-stones, each having a central rib on the upper surface. Inside the chapel is a large late 17th or early 18th century armorial stone. As described. The burial ground is still in use. Name not known locally. Visited by OS (RL), 4 May 1969. 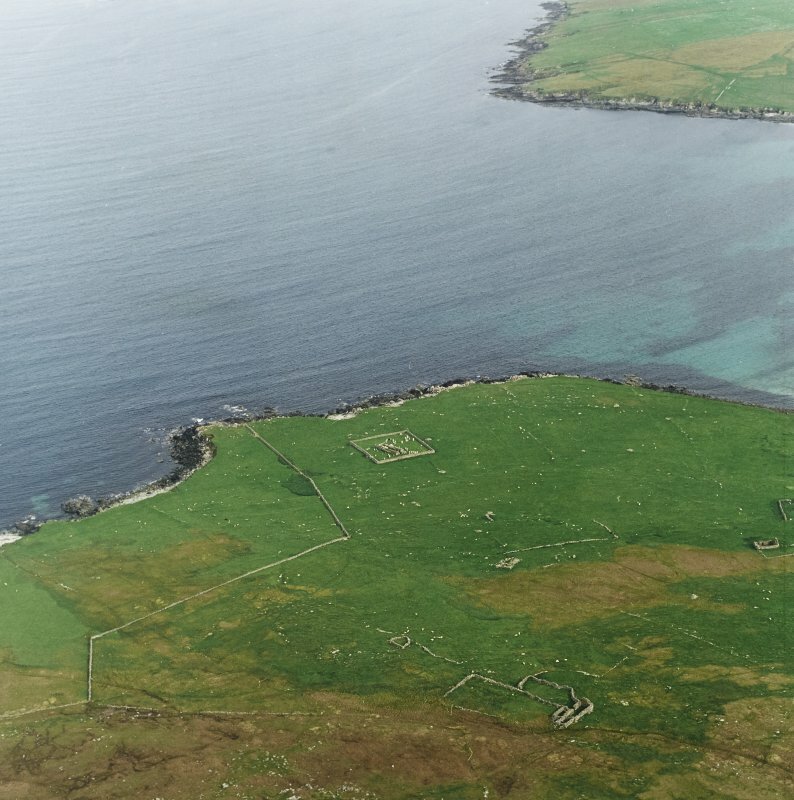 This chapel and burial-ground, situated in improved pasture about 50m WNW of Kirk Geo, remain as described by RCAHMS in 1946.